We have a saying in our family, "It's good to be a regular!" And of course I would add, "...in Paris!!!" After a wonderful trip to Italy and France in 2014 to celebrate my 60th birthday, we returned to France last month and spent one blissful, languorous week in the sun at Hotel Le Hameau in St Paul de Vence and 3 active (!) weeks in Paris, in accomodations through Guest Apartment Services. We traveled to Paris (and France, generally) to assess trends at Maison et Objet (see my post on that here), shop at the Marché aux Puces and also the Village St Paul in the Marais, and - certainly not least - celebrate our 30th Anniversary....! Having shopped at the Marché aux Puces last year, and now again this year, I guess we're almost regulars! There is really so much to see - it's over 20 acres of dealers' showrooms/stalls so it entails a huge amount of walking, though, being Paris, there are plenty of places to take a break for a meal and wine. But be sure to wear comfortable shoes anyway! While in Bachelier Antiquités, I found these wine box remnants and was given a super price, I guess because I bought so much there last year - or maybe it's because Bob made friends with Maman Bachelier.... Anyway, yes, it's good to be a regular! Posted on October 15, 2015 by Jann Placentia and filed under Paris, Marche aux Puces st Ouen and tagged Antiques Shopping. ......and whisked us to the adventure that awaited at the "M.A.P. ", the Marche aux Puces at Saint Ouen, the largest antiques market in the world and the 4th tourist attraction in France. 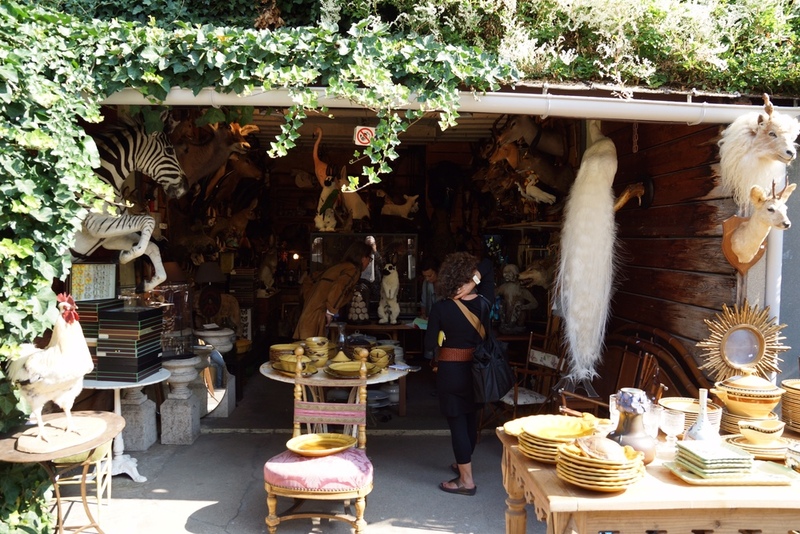 Covering a little over 17 acres, it's filled with upscale antiques, furniture & lighting, fantastic items for the kitchen - and even taxidermy. Basking in the atmosphere of les Puces, I was just moseying along when I wandered into one of the coolest places I've ever been - ever - Bachelier Antiquites. Oh, what a place! They specialize in "Antiquites de la cuisine et du vin" (Kitchen and wine antiques) and their very photogenic storefront has been featured in many films and commercials. It was heaven for me! As enthralled as I was surrounded by all of the "cuisinier" accesories, my husband was having fun, too. I found him deep in conversation, chatting (even though he hardly speaks any French!) with the matriarch of the family, Francoise-Anne Bachelier. She then autographed a copy of her cookbook, Toques de terrines, and gave it to me! Très sympathique! Lunch was delicious - no surprize - at an outdoor cafe (this is still Paris, after all) in the Paul Bert Serpette market where the people watching, and eavesdropping, was almost as entertaining as the shopping. It was such a fun day - I can't wait to return! Who wants to join me? Posted on October 31, 2014 by Jann Placentia and filed under Marche aux Puces st Ouen.